A recent study found that the number one barrier to micro-business growth is cashflow. The study also found that 48% of businesses lose sales or face delayed payments, and one in ten said that they lose salesbecause they don’t have the ability to take the right kind of payment. Don’t let your business falter because you can’t take credit cards! Using a mobile point-of-sale (mPOS) system like SmartTrade will help you generate more business—and make more money from that business. You work hard to generate job leads and get new customers. Why would you throw that away by not accepting credit cards? We were surprised to find out that only 2% of micro-businesses in the survey were currently using a mobile solution to take payments. It’s easy to see that cash is on the way out. Fewer people are using cash, opting for credit cards, debit cards, contactless payments, and even mobile wallet apps. Almost no one writes cheques anymore. Which means if you can only do business with people who pay cash or write a check, you’re losing customers. 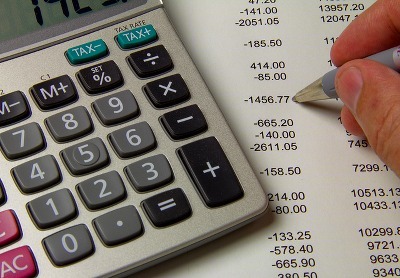 And lost customers means even more difficulties with cashflow, one of the most common problems for small businesses. Accepting credit cards can be an expensive proposition: with traditional providers, like PayPal Here, Intuit, and iZettle, you have to use extra hardware that gets in the way or can get broken. You pay fees for all sorts of things, sometimes including monthly or contract fees. You often need a merchant account, too, which is a huge pain to deal with—it’s expensive, difficult to obtain, and isn’t worth the expense in time or money. Why put up with cashflow problems, late payments, and lost work due to not being able to take credit card payments? Download SmartTrade todayor set up a free demo to see how it works! 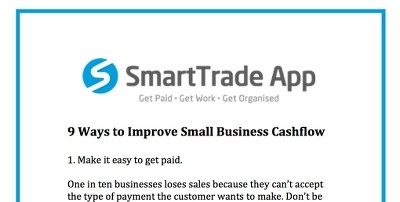 Want to find out how to improve cashflow in your small business? We put together 9 great tips in this handy PDF guide. Just click here to download it or click the image above! Image credit: Ken Teegardin via Flickr. Want to keep up with Dann? Follow him on Twitter or circle him on Google+!